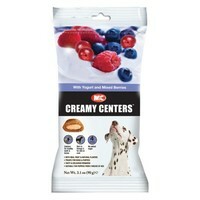 M & C Creamy Centers Dog Treats - Yogurt and Mixed Berries. An exciting new cereal treat containing delicious yogurt and real raspberries, cranberries and blueberries. Made from all natural ingredients, the treats are calcium enriched for healthy teeth and bones, and contain Omega 3 oil to promote your dog's skin and coat. Only containing 5 calories each, Creamy Center Treats are free from artificial colours, have no added sugar and benefit from being low in saturated fats. Suitable for puppies from 4 weeks of age. Got these for our Cav and cav cross and they love them. Clever things even keep an inventory of them so any time i go near their cupboard they are on my case and give me the sad eye look to try and get some off me. Really good treat for my girl,I couldn't give 5 stars purely because the size of the packet is so small. I think perhaps even if you give a choice of sizes could be more economical,but basically smells nice,quite pleased.